1979 - The Jacksons perform Destiny tour in Indianapolis[US]. 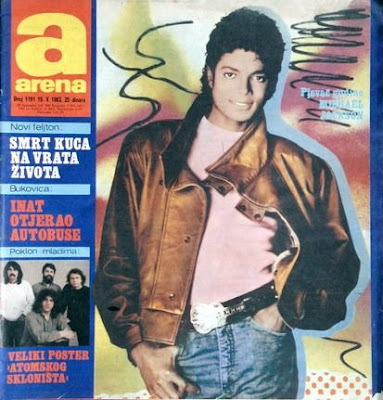 1983 - Arena magazine[Yugoslavia (Serbia and Montenegro)] featured Michael on their cover. 1984 - The Jacksons perform Victory tour at Municipal Stadium in Cleveland, Ohio [USA] attending 50,000. 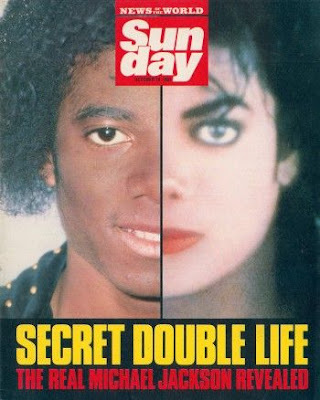 1987 - Sunday magazine [UK] featured Michael on their cover story: SECRET DOUBLE LIFE: The Real Michael Jackson Revealed. 1988 -Michael performs BAD tour at Capital Centre in Washington DC [US]. 2001 - What More Can I Give, completed on 19th October 2001, premiered two days later at the ‘United We Stand – What More Can I Give’ concert at Washington DC’s RFK Stadium, in front of 46,000 people. 2009 - Two legal documents, signed by Michael Jackson, handing to USA for Africa the profits from the 1985 hit We Are the World that Jackson and Lionel Richie wrote, and which brought in "tens of millions", will go to auction, benefiting VH1's Save the Music Foundation. "(Michael Jackson) was a bigger philanthropist than most people gave him credit for," USA for Africa Executive Director, Marcia Thomas, says of the singer-entertainer. "He didn't do it for the credit. He did it because he felt it was the right thing to do." Nancy Birdsall, president of the Washington-based Center for Global Development, adds that "We Are the World marked what at that time was a high point in rich-world concern about poor people in the developing world. That sort of awareness helps to open the way not only for more effective foreign assistance but for other changes in policy, such as trade and migration, that can have a big impact on poor people's lives." The 2 legal documents, transferring his rights and profits to the group USA for Africa, are estimated to gross in 50,000 dollars at the Alexander Autographs auction at the Mohegan Sun casino in Connecticut. The in-person and online auction includes a huge number of rock-and-roll and Hollywood artifacts and is organized by an auction house noted for its historical and political offerings. This entry was posted on 19 October 2010 at Tuesday, October 19, 2010 and is filed under 1979, 1983, 1984, 1987, 1988, 2001, 2009 . You can follow any responses to this entry through the comments feed .